The Mandalorian, the first ever live-action Star Wars TV series, won't be a binge-watching affair. Disney and Lucasfilm recently descended upon Star Wars Celebration in Chicago to finally pull the curtain back on their mysterious show. We learned an awful lot about the bounty hunter-heavy shenanigans coming our way later this year. But the panel didn't specify how exactly the show is going to be released. Now we have word that it's not going to go the Netflix route. According to a new report, only the first episode, possibly the first two, of The Mandalorian will be released when Disney+ debuts this November. It had been revealed during Disney's recent investor conference that the series would launch with their new streaming service, but it wasn't clear what that meant. Were we getting one episode? A full season? Now we know. While there are certainly going to be fans who want to just take in everything this show has to offer as quickly as possible, this may be for the best. I was lucky enough to be on hand at the panel for the show at Star Wars Celebration. Based on the large amount of footage we were shown, this thing looks incredibly cinematic. Yet, we're all going to be watching it on a TV in our living room. Or maybe even a tablet. That, in itself, is going to be strange for Star Wars. But a large part of what's fun about the franchise is seeing something new and having the fanbase talk about it. Going with a more traditional release schedule, that will still be possible. We can all follow along week-to-week (or however they decide to do it) and talk about it as it comes. This series takes place five years after the events of Return of the Jedi and will explore a time period we haven't really explored previously. The show centers on a lone gunslinger who is making his way in the galaxy until he's offered an intriguing and mysterious bounty one day that is worth a fortune. 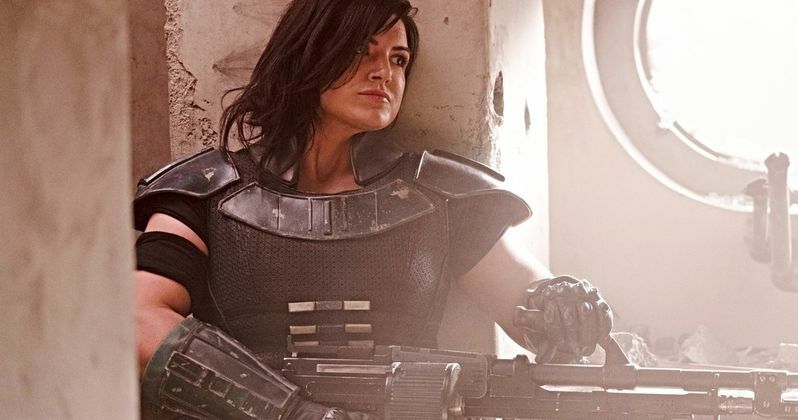 The cast includes Pedro Pascal as The Mandalorian, Gina Carano as Cara Dune and Carl Weathers as Greef Karga. The cast also includes Nick Nolte and Werner Herzog. It hasn't yet been revealed how many episodes the first season will consist of. There are, however, rumors that Disney is already looking at giving a season 2 order to the series, which bodes well for what's to come. Jon Favreau (Iron Man) serves as writer/executive producer on the series, with Dave Filoni (The Clone Wars, Rebels) on board as a director/executive producer. Other directors include Taika Waititi (Thor: Ragnarok), Bryce Dallas Howard (Solemates), Rick Famuyiwa (Dope) and Deborah Chow (Jessica Jones). Unfortunately, Lucasfilm decided not to release any of the footage online yet, but hopefully we'll all be seeing something sooner rather than later. Be sure to check out the news from Entertainment Weekly reporter Anthony Breznican's Twitter account.